For other uses, see Southampton (disambiguation). Southampton (/saʊθˈ(h)æmptən/ ( listen)) is the largest city in the ceremonial county of Hampshire, England. It is 70 miles (110 km) south-west of London and 15 miles (24 km) west north-west of Portsmouth. Southampton is a major port and the closest city to the New Forest. It lies at the northernmost point of Southampton Water at the confluence of the Rivers Test and Itchen, with the River Hamble joining to the south of the urban area. The city, which is a unitary authority, has an estimated population of 253,651. The city's name is sometimes abbreviated in writing to "So'ton" or "Soton", and a resident of Southampton is called a Sotonian. Significant employers in the city include Southampton City Council, the University of Southampton, Solent University, Southampton Airport, Ordnance Survey, BBC South, the NHS, ABP and Carnival UK. Southampton is noted for its association with the RMS Titanic, the Spitfire and more generally in the World War II narrative as one of the departure points for D-Day, and more recently as the home port of a number of the largest cruise ships in the world. Southampton has a large shopping centre and retail park, Westquay. In 2014, the city council approved a neighbouring followup Westquay South which opened in 2016–2017. In the 2001 census Southampton and Portsmouth were recorded as being parts of separate urban areas; however by the time of the 2011 census they had merged apolitically to become the sixth-largest built-up area in England with a population of 855,569. 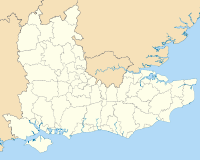 This built-up area is part of the metropolitan area known as South Hampshire, which is also known as Solent City, particularly in the media when discussing local governance organisational changes. With a population of over 1.5 million this makes the region one of the United Kingdom's most populous metropolitan areas. Archaeological finds suggest that the area has been inhabited since the stone age. Following the Roman invasion of Britain in AD 43 and the conquering of the local Britons in AD 70 the fortress settlement of Clausentum was established. It was an important trading port and defensive outpost of Winchester, at the site of modern Bitterne Manor. Clausentum was defended by a wall and two ditches and is thought to have contained a bath house. Clausentum was not abandoned until around 410. The Anglo-Saxons formed a new, larger, settlement across the Itchen centred on what is now the St Mary's area of the city. The settlement was known as Hamwic, which evolved into Hamtun and then Hampton. Archaeological excavations of this site have uncovered one of the best collections of Saxon artefacts in Europe. It is from this town that the county of Hampshire gets its name. Following the Norman Conquest in 1066, Southampton became the major port of transit between the then capital of England, Winchester, and Normandy. Southampton Castle was built in the 12th century and surviving remains of 12th-century merchants' houses such as King John's House and Canute's Palace are evidence of the wealth that existed in the town at this time. By the 13th century Southampton had become a leading port, particularly involved in the import of French wine in exchange for English cloth and wool. The Franciscan friary in Southampton was founded circa 1233. The friars constructed a water supply system in 1290, which carried water from Conduit Head (remnants of which survive near Hill Lane, Shirley) some 1.1 miles (1.7 km) to the site of the friary inside the town walls. [verification needed] Further remains can be observed at Conduit House on Commercial Road. The town was sacked in 1338 by French, Genoese and Monegasque ships (under Charles Grimaldi, who used the plunder to help found the principality of Monaco). On visiting Southampton in 1339, Edward III ordered that walls be built to 'close the town'. The extensive rebuilding—part of the walls dates from 1175—culminated in the completion of the western walls in 1380. Roughly half of the walls, 13 of the original towers, and six gates survive. In 1348, the Black Death reached England via merchant vessels calling at Southampton. Prior to King Henry's departure for the Battle of Agincourt in 1415, the ringleaders of the "Southampton Plot"—Richard, Earl of Cambridge, Henry Scrope, 3rd Baron Scrope of Masham, and Sir Thomas Grey of Heton—were accused of high treason and tried at what is now the Red Lion public house in the High Street. They were found guilty and summarily executed outside the Bargate. The city walls include God's House Tower, built in 1417, the first purpose-built artillery fortification in England. Over the years it has been used as home to the city's gunner, the Town Gaol and even as storage for the Southampton Harbour Board. Until September 2011, it housed the Museum of Archaeology. The walls were completed in the 15th century, but later development of several new fortifications along Southampton Water and the Solent by Henry VIII meant that Southampton was no longer dependent upon its fortifications. During the Middle Ages, shipbuilding had become an important industry for the town. Henry V's famous warship HMS Grace Dieu was built in Southampton and launched in 1418. The port was the point of departure for the Pilgrim Fathers aboard Mayflower in 1620. In 1642, during the English Civil War, a Parliamentary garrison moved into Southampton. The Royalists advanced as far as Redbridge in March 1644 but were prevented from taking the town. The town experienced major expansion during the Victorian era. The Southampton Docks company had been formed in 1835. In October 1838 the foundation stone of the docks was laid and the first dock opened in 1842. The structural and economic development of docks continued for the next few decades. The railway link to London was fully opened in May 1840. Southampton subsequently became known as The Gateway to the Empire. The port was used for military embarkation, including the Crimean war and the Boer War. From 1904 to 2004, the Thornycroft shipbuilding yard was a major employer in Southampton, building and repairing ships used in the two World Wars. In 1912, the RMS Titanic sailed from Southampton. Four in five of the crew on board the vessel were Sotonians, with about a third of those who perished in the tragedy hailing from the city. Southampton was subsequently the home port for the transatlantic passenger services operated by Cunard with their Blue Riband liner RMS Queen Mary and her running mate RMS Queen Elizabeth. In 1938, Southampton docks also became home to the flying boats of Imperial Airways. Southampton Container Terminals first opened in 1968 and has continued to expand. Southampton was designated No. 1 Military Embarkation port during the Great War and became a major centre for treating the returning wounded and POWs. It was also central to the preparations for the Invasion of Europe in 1944. The Supermarine Spitfire was designed and developed in Southampton, evolving from the Schneider trophy-winning seaplanes of the 1920s and 1930s. Its designer, R J Mitchell, lived in the Portswood area of Southampton, and his house is today marked with a blue plaque. Heavy bombing of the Woolston factory in September 1940 destroyed it as well as homes in the vicinity, killing civilians and workers. World War II hit Southampton particularly hard because of its strategic importance as a major commercial port and industrial area. Prior to the Invasion of Europe, components for a Mulberry harbour were built here. After D-Day, Southampton docks handled military cargo to help keep the Allied forces supplied, making it a key target of Luftwaffe bombing raids until late 1944. Southampton docks was featured in the television show 24: Live Another Day in Day 9: 9:00 p.m. – 10:00 p.m.
630 people lost their lives as a result of the air raids on Southampton and nearly 2,000 more were injured, not to mention the thousands of buildings damaged or destroyed. Pockets of Georgian architecture survived the war, but much of the city was levelled. There has been extensive redevelopment since World War II. Increasing traffic congestion in the 1920s led to partial demolition of medieval walls around the Bargate in 1932 and 1938. However, a large portion of those walls remain. A Royal Charter in 1952 upgraded University College at Highfield to the University of Southampton. In 1964 Southampton acquired city status, becoming the City of Southampton, and because of the Local Government Act 1972 was turned into a county borough within the Hampshire county in 1973. The local council for the city of Southampton succeeded Hampshire County Council and became a unitary authority in April 1997. In the 2010s several developments to the inner-city of Southampton were completed. In 2016 the south section of West Quay, or West Quay South, originally known as West Quay Watermark, was opened to the public. Its public plaza has been used for several annual events, such as an ice skating rink during the winter season, and a public broadcast of the Wimbledon tennis championship. Two new buildings, the John Hansard Gallery with City Eye and a secondary site for the University of Southampton's Nuffield Theatre, in addition to several flats, have been built in the "cultural quarter" adjacent to Guildhall Square in 2017. In 2019 the retail and accommodation-based "Bargate quarter" redevelopment, replacing the demolished Bargate shopping centre, and enabling public access to the previously hidden sections of the city walls, will be opened. After the establishment of Hampshire County Council, following the act in 1888, Southampton became a county borough within the county of Hampshire, which meant that it had many features of a county, but governance was now shared between the Corporation in Southampton and the new county council. There is scope for confusion in the fact that the ancient shire county, along with its associated assizes, was known as the County of Southampton or Southamptonshire. This was officially changed to Hampshire in 1959 although the county had been commonly known as Hampshire or Hantscire for centuries. Southampton became a non-metropolitan district in 1974. The city has undergone many changes to its governance over the centuries and once again became administratively independent from Hampshire County as it was made into a unitary authority in a local government reorganisation on 1 April 1997, a result of the 1992 Local Government Act. The district remains part of the Hampshire ceremonial county. There are three members of parliament for the city: Royston Smith (Conservative) for Southampton Itchen, the constituency covering the east of the city; Dr. Alan Whitehead (Labour) for Southampton Test, which covers the west of the city; and Caroline Nokes (Conservative) for Romsey and Southampton North, which includes a northern portion of the city. Southampton City Council has developed twinning links with Le Havre in France (since 1973), Rems-Murr-Kreis in Germany (since 1991), Trieste in Italy (since 2002); Hampton, Virginia in USA, Qingdao in China (since 1998), and Busan in South Korea (since 1978). The geography of Southampton is influenced by the sea and rivers. The city lies at the northern tip of the Southampton Water, a deep water estuary, which is a ria formed at the end of the last Ice Age. Here, the rivers Test and Itchen converge. The Test—which has salt marsh that makes it ideal for salmon fishing—runs along the western edge of the city, while the Itchen splits Southampton in two—east and west. The city centre is located between the two rivers. Southampton Water has the benefit of a double high tide, with two high tide peaks, making the movement of large ships easier. This is not caused as popularly supposed by the presence of the Isle of Wight, but is a function of the shape and depth of the English Channel. In this area the general water flow is distorted by more local conditions reaching across to France. The city lies in the Hampshire Basin, which sits atop chalk beds. The River Test runs along the western border of the city, separating it from the New Forest. There are bridges over the Test from Southampton, including the road and rail bridges at Redbridge in the south and the M27 motorway to the north. The River Itchen runs through the middle of the city and is bridged in several places. The northernmost bridge, and the first to be built, is at Mansbridge, where the A27 road crosses the Itchen. The original bridge is closed to road traffic, but is still standing and open to pedestrians and cyclists. The river is bridged again at Swaythling, where Woodmill Bridge separates the tidal and non tidal sections of the river. Further south is Cobden Bridge which is notable as it was opened as a free bridge (it was originally named the Cobden Free Bridge), and was never a toll bridge. Downstream of the Cobden Bridge is the Northam Railway Bridge, then the Northam Road Bridge, which was the first major pre-stressed concrete bridge to be constructed in the United Kingdom. The southernmost, and newest, bridge on the Itchen is the Itchen Bridge, which is a toll bridge. Southampton is divided into council wards, suburbs, constituencies, ecclesiastical parishes, and other less formal areas. It has a number of parks and green spaces, the largest being the 148-hectare Southampton Common, parts of which are used to host the annual summer festivals, circuses and fun fairs. The Common includes Hawthorns Urban Wildlife Centre on the former site of Southampton Zoo, a paddling pool and several lakes and ponds. Council estates are in the Weston, Thornhill and Townhill Park districts. The city is ranked 96th most deprived out of all 354 Local Authorities in England. There are 16 Electoral Wards in Southampton, each consisting of longer-established neighbourhoods (see below). Settlements outside the city are sometimes considered suburbs of Southampton, including Chartwell Green, Chilworth, Nursling, Rownhams, Totton, Eastleigh and West End. The villages of Marchwood, Ashurst and Hedge End may be considered exurbs of Southampton. As with the rest of the UK, Southampton experiences an oceanic climate (Köppen: Cfb). Its southerly, low-lying and sheltered location ensures it is among the warmer, sunnier cities in the UK. It has held the record for the highest temperature in the UK for June at 35.6 °C (96.1 °F) since 1976. The centre of Southampton is located above a large hot water aquifer that provides geothermal power to some of the city's buildings. This energy is processed at a plant in the West Quay region in Southampton city centre, the only geothermal power station in the UK. The plant provides private electricity for the Port of Southampton and hot water to the Southampton District Energy Scheme used by many buildings including the Westquay shopping centre. In a 2006 survey of carbon emissions in major UK cities conducted by British Gas, Southampton was ranked as being one of the lowest carbon-emitting cities in the United Kingdom. 2016 mid-year population estimates suggests there are 254,275 people within the Southampton area. The Office for National Statistics based upon 2016 estimate forecast population in the city to increase to 281,200 by 2014, a 10.6% increase over the period. Southampton had an estimated 236,900 people living within the city boundary in the 2011 Census. There are 119,500 males within the city and 117,400 females. The 20–24 age range is the most populous, with an estimated 32,300 people falling in this age range. Next largest is the 25–29 range with 24,700 people and then 30–34 years with 17,800. By population, Southampton is the largest monocentric city in the South East England region and the second-largest on the South Coast after Plymouth. Furthermore, 92.4 per cent of the city's populace were white—including one per cent white Irish—3.8 per cent were South Asian, 1.0 per cent black, 1.3 per cent Chinese or other ethnic groups, and 1.5 per cent were of mixed race. Council figures from 2006 suggested a sizeable Polish population in the city, with estimates as high as 20,000. Southampton has always been a port, and the docks have long been a major employer in the city. In particular, it is a port for cruise ships; its heyday was the first half of the 20th century, and in particular the inter-war years, when it handled almost half the passenger traffic of the UK. Today it remains home to luxury cruise ships, as well as being the largest freight port on the Channel coast and fourth-largest UK port by tonnage, with several container terminals. Unlike some other ports, such as Liverpool, London, and Bristol, where industry and docks have largely moved out of the city centres leaving room for redevelopment, Southampton retains much of its inner-city industry. Despite the still-active and expanding docklands to the west of the city centre, further enhanced with the opening of a fourth cruise terminal in 2009, parts of the eastern docks have been redeveloped; the Ocean Village development, which included a local marina and small entertainment complex, is a good example. Southampton is home to the headquarters of both the Maritime and Coastguard Agency and the Marine Accident Investigation Branch of the Department for Transport in addition to cruise operator Carnival UK. University Hospital Southampton NHS Foundation Trust is one of the city's largest employers. It provides local hospital services to 500,000 people in the Southampton area and specialist regional services to more than 3 million people across the South of England. The Trust owns and manages Southampton General Hospital, the Princess Anne Hospital and a palliative care service at Countess Mountbatten House, part of the Moorgreen Hospital site in the village of West End, just outside the city. Other major employers in the city include Ordnance Survey, the UK's national mapping agency, whose headquarters is located in a new building on the outskirts of the city, opened in February 2011. The Lloyd's Register Group has announced plans to move its London marine operations to a specially developed site at the University of Southampton. Southampton's largest retail centre, and 35th-largest in the UK, is the Westquay Shopping Centre, which opened in September 2000 and hosts major high street stores including John Lewis and Marks and Spencer. The centre was Phase Two of the West Quay development of the former Pirelli undersea cables factory; the first phase of this was the West Quay Retail Park, while the third phase (Watermark WestQuay) was put on hold due to the recession. Work resumed in 2015, with plans for this third stage including shops, housing, an hotel and a public piazza alongside the Town Walls on Western Esplanade. Southampton has also been granted a licence for a large casino. A further part of the redevelopment of the West Quay site resulted in a new store, opened on 12 February 2009, for Swedish home products retailer IKEA. Marlands is a smaller shopping centre, built in the 1990s on the site of the former bus station and located close to the northern side of Westquay. In October 2014, the city council approved a follow-up from the Westquay park, WestQuay Watermark. Construction by Sir Robert McAlpine commenced in January 2015. Its owners, Hammerson, aim to have at least 1,550 people employed on site at year-end 2016. Opened in 2016–2017, it has been renamed Westquay South. The city is home to the longest surviving stretch of medieval walls in England, as well as a number of museums such as Tudor House Museum, reopened on 30 July 2011 after undergoing extensive restoration and improvement; Southampton Maritime Museum; God's House Tower, an archaeology museum about the city's heritage and located in one of the tower walls; the Medieval Merchant's House; and Solent Sky, which focuses on aviation. The SeaCity Museum is located in the west wing of the civic centre, formerly occupied by Hampshire Constabulary and the Magistrates' Court, and focuses on Southampton's trading history and on the RMS Titanic. The museum received half a million pounds from the National Lottery in addition to interest from numerous private investors and is budgeted at £28 million. The annual Southampton Boat Show is held in September each year, with over 600 exhibitors present. It runs for just over a week at Mayflower Park on the city's waterfront, where it has been held since 1968. The Boat Show itself is the climax of Sea City, which runs from April to September each year to celebrate Southampton's links with the sea. The largest theatre in the city is the 2,300-capacity Mayflower Theatre (formerly known as the Gaumont), which, as the largest theatre in Southern England outside London, has hosted West End shows such as Les Misérables, The Rocky Horror Show and Chitty Chitty Bang Bang, as well as regular visits from Welsh National Opera and English National Ballet. There is also the Nuffield Theatre based at the University of Southampton's Highfield campus, which is the city's primary producing theatre. It was awarded The Stage Award for Best Regional Theatre in 2015. It also hosts touring companies and local performing societies (such as Southampton Operatic Society, the Maskers and the University Players). There are many innovative art galleries in the city. The Southampton City Art Gallery at the Civic Centre is one of the best known and as well as a nationally important Designated Collection, houses several permanent and travelling exhibitions. The Solent Showcase at Southampton Solent University, the John Hansard Gallery at Southampton University as well as smaller galleries including the Art House in Above Bar Street provide a different view. The city's Bargate is also an art gallery run by the arts organisation "a space". A space also run the Art Vaults project, which creatively uses several of Southampton's medieval vaults, halls and cellars as venues for contemporary art installations. The city also has several smaller music venues, including the Engine Rooms, The Talking Heads, The 1865, The Joiners and Turner Sims, as well as smaller "club circuit" venues like Hampton's and Lennon's, and a number of public houses including the Platform tavern, the Dolphin, the Blue Keys and many others. The Joiners has played host to such acts as Oasis, Radiohead, Green Day, Suede, PJ Harvey, the Manic Street Preachers, Coldplay, the Verve, the Libertines and Franz Ferdinand, while Hampton's and Lennon's have hosted early appearances by Kate Nash, Scouting for Girls and Band of Skulls. The nightclub, Junk, has been nominated for the UK's best small nightclub, and plays host to a range of dance music's top acts. The city is home or birthplace to a number of contemporary musicians such as R'n'B and garage singer Craig David, Coldplay drummer Will Champion, Voice FM radio presenter Riskology Radcliffe, R.n'B Hip-hop artist Jay Ikwan, former Holloways singer Rob Skipper, 1980s popstar Howard Jones as well as Grammy Award-winning popstar Foxes. The garage scene in Southampton is further championed by the duo Artful Dodger who formed in the city in the late 90's, as well as the UKG, grime and bassline producer, Royal-T, part of the TQD group formed with DJ Q and Flava D. Several active rock and metal bands were formed in Southampton, including Band of Skulls, Bury Tomorrow, Creeper and The Delays. Notable bands who are now defunct include Thomas Tantrum (disbanded in 2011), Kids Can't Fly (disbanded in 2014) and Heart in Hand (dispanded in 2015). Local media include the Southern Daily Echo newspaper based in Redbridge and BBC South, which has its regional headquarters in the city centre opposite the civic centre. From there the BBC broadcasts South Today, the local television news bulletin and BBC Radio Solent. The local ITV franchise is Meridian, which has its headquarters in Whiteley, around nine miles (14 kilometres) from the city. Until December 2004, the station's studios were located in the Northam area of the city on land reclaimed from the River Itchen. That's Solent is a local television channel that began broadcasting in November 2014, which will be based in and serve Southampton and Portsmouth. As of November 2017, the most popular commercial radio station is the adult contemporary regional radio station Wave 105 (11.6% listening share in its total survey area) followed by the hit music station Capital South Coast (7%) a networked station from London with local breakfast and drive shows. Other stations include Heart Hampshire and The Breeze (2.2%), and 106 Sam FM (2.7%) (http://www.samfm.co.uk/southcoast/). In addition, Southampton University has a radio station called SURGE, broadcasting on AM band as well as through the web. Southampton is home to Southampton Football Club—nicknamed "The Saints"—the club plays in the Premier League at St Mary's Stadium, having relocated in 2001 from their 103-year-old former stadium, "The Dell". They reached the top flight of English football (First Division) for the first time in 1966, staying there for eight years. They lifted the FA Cup with a shock victory over Manchester United in 1976, returned to the top flight two years later, and stayed there for 27 years (becoming founder members of the Premier League in 1992) before they were relegated in 2005. The club was promoted back to the Premier League in 2012 following a brief spell in the third tier and severe financial difficulties. In 2015, "The Saints" finished 7th in the Premier League, their highest league finish in 30 years, after a remarkable season under new manager Ronald Koeman. Their highest league position came in 1984 when they were runners-up in the old First Division. They were also runners-up in the 1979 Football League Cup final and 2003 FA Cup final. Notable former managers include Ted Bates, Lawrie McMenemy, Chris Nicholl, Ian Branfoot and Gordon Strachan. There is a strong rivalry between Portsmouth F.C. ("South Coast derby") which is located only about 20 miles (30 km) away. Hampshire County Cricket Club play close to the city, at the Rose Bowl in West End, after previously playing at the County Cricket Ground and the Antelope Ground, both near the city centre. There is also the Southampton Evening Cricket League. The city is also well provided for in amateur men's and women's rugby with a number of teams in and around the city, the oldest of which is Trojans RFC who were promoted to London South West 2 division in 2008/9. A notable former player is Anthony Allen, who played with Leicester Tigers as a centre. Tottonians are also in London South West division 2 and Southampton RFC are in Hampshire division 1 in 2009/10, alongside Millbrook RFC and Eastleigh RFC. Many of the sides run mini and midi teams from under sevens up to under sixteens for both boys and girls. The city provides for yachting and water sports, with a number of marinas. From 1977 to 2001 the Whitbread Around the World Yacht Race, which is now known as the Volvo Ocean Race was based in Southampton's Ocean Village marina. The city also has the Southampton Sports Centre which is the focal point for the public's sporting and outdoor activities and includes an Alpine Centre, theme park and athletics centre which is used by professional athletes. With the addition of 11 other additional leisure ventures which are currently operate by the Council leisure executives. However these have been sold the operating rights to "Park Wood Leisure." Southampton was named "fittest city in the UK" in 2006 by Men's Fitness magazine. The results were based on the incidence of heart disease, the amount of junk food and alcohol consumed, and the level of gym membership. In 2007, it had slipped one place behind London, but was still ranked first when it came to the parks and green spaces available for exercise and the amount of television watched by Sotonians was the lowest in the country. Thousands enter and run the Southampton Marathon in April every year. Speedway and racing took place at Banister Court Stadium in the pre-war era. It returned in the 1940s after WW2 and the Saints operated until the stadium closed down at the end of 1963. A training track operated in the 1950s in the Hamble area. Greyhound racing was also held at the stadium from 1928 to 1963. Southampton is also home to two American football teams, the Solent Thrashers, who play at the Test Park Sports Ground, and the Southampton Stags, who play at the Wide Lane Sports Facility in Eastleigh. The world's oldest surviving bowling green is the Southampton Old Bowling Green, which was first used in 1299. Southampton's police service is provided by Hampshire Constabulary. The main base of the Southampton operation is a new, eight-storey purpose-built building which cost £30 million to construct. The building, located on Southern Road, opened in 2011 and is near to Southampton Central railway station. Previously, the central Southampton operation was located within the west wing of the Civic Centre; however, the ageing facilities and the plans of constructing a new museum in the old police station and magistrates court necessitated the move. There are additional police stations at Portswood, Banister Park and Shirley as well as a British Transport Police station at Southampton Central railway station. Southampton's fire cover is provided by Hampshire Fire and Rescue Service. There are three fire stations within the city boundaries at St Mary's, Hightown and Redbridge. The ambulance service is provided by South Central Ambulance Service. The national headquarters of the Maritime and Coastguard Agency is located in Commercial Road. Southampton has two universities, namely the University of Southampton and Southampton Solent University. Together, they have a student population of 40,000. Though students numbers had increased in the 80s, 90s, and upto 2011 they began to reduce due to changes in immigration rules and dropped further after 2016 due to Brexit. Of these, 2,880 are from EU, and the rest are from UK, Asia and Africa. The University of Southampton, which was founded in 1862 and received its Royal Charter as a university in 1952, has over 22,000 students. The university is ranked in the top 100 research universities in the world in the Academic Ranking of World Universities 2010. In 2010, the THES - QS World University Rankings positioned the University of Southampton in the top 80 universities in the world. The university considers itself one of the top 5 research universities in the UK. The university has a global reputation for research into engineering sciences, oceanography, chemistry, cancer sciences, sound and vibration research, computer science and electronics and optoelectronics. It is also home to the National Oceanography Centre, Southampton (NOCS), the focus of Natural Environment Research Council-funded marine research. There are also independent schools, including The Gregg School, King Edward VI School and St Mary's Independent School. Southampton is a major UK port which has good transport links with the rest of the country. The M27 motorway, linking places along the south coast of England, runs just to the north of the city. The M3 motorway links the city to London and also, via a link to the A34 (part of the European route E05) at Winchester, with the Midlands and North. The M271 motorway is a spur of the M27, linking it with the Western Docks and city centre. Southampton is also served by the rail network, which is used both by freight services to and from the docks and passenger services as part of the national rail system. The main station in the city is Southampton Central. Rail routes run east towards Portsmouth, north to Winchester, the Midlands and London, and westwards to Bournemouth, Poole, Dorchester, Weymouth, Salisbury, Bristol and Cardiff. The route to London was opened in 1840 by what was to become the London and South Western Railway Company. Both this and its successor, Southern Railway, played a significant role in the creation of the modern port following their purchase and development of the town's docks. Local train services operate in the city and are operated by South Western Railway, with stations at Swaythling, St Denys, Millbrook, Redbridge, Bitterne, Sholing and Woolston. Plans were announced by Hampshire County Council in July 2009 for the introduction of tram-train running from Hythe (on what is now a freight-only line to Fawley) via Totton to Southampton Central Station and on to Fareham via St. Denys, and Swanwick. The proposal follows a failed plan to bring light rail to the Portsmouth and Gosport areas in 2005. The town was the subject of an attempt by a separate company, the Didcot, Newbury and Southampton Railway, to open another rail route to the North in the 1880s and some building work, including a surviving embankment, was undertaken in the Hill Lane area. Southampton Airport is a regional airport located in the town of Eastleigh, just north of the city. It offers flights to UK and near European destinations, and is connected to the city by a frequent rail service from Southampton Airport Parkway railway station, and by bus services. For longer flights, Gatwick Airport is linked by a regular rail service, and Heathrow Airport is linked by National Express coach services. Many of the world's largest cruise ships can regularly be seen in Southampton water, including record-breaking vessels from Royal Caribbean and Carnival Corporation & plc. The latter has headquarters in Southampton, with its brands including Princess Cruises, P&O Cruises and Cunard Line. The city has a particular connection to Cunard Line and their fleet of ships. This was particularly evident on 11 November 2008 when the Cunard liner RMS Queen Elizabeth 2 departed the city for the final time amid a spectacular fireworks display after a full day of celebrations. Cunard ships are regularly christened in the city, for example Queen Victoria was named by HRH The Duchess of Cornwall in December 2007, and the Queen named Queen Elizabeth in the city during October 2011. The Duchess of Cambridge performed the naming ceremony of Royal Princess on 13 June 2013. The importance of Southampton to the cruise industry was indicated by P&O Cruises' 175th-anniversary celebrations, which included all seven of the company's liners visiting Southampton in a single day. Adonia, Arcadia, Aurora, Azura, Oceana, Oriana and Ventura all left the city in a procession on 3 July 2012. While Southampton is no longer the base for any cross-channel ferries, it is the terminus for three internal ferry services, all of which operate from terminals at Town Quay. Two of these, a car ferry service and a fast catamaran passenger ferry service, provide links to East Cowes and Cowes, respectively, on the Isle of Wight and are operated by Red Funnel. The third ferry is the Hythe Ferry, providing a passenger service to Hythe on the other side of Southampton Water. Southampton used to be home to a number of ferry services to the continent, with destinations such as San Sebastian, Lisbon, Tangier and Casablanca. A ferry port was built during the 1960s. However, a number of these relocated to Portsmouth and by 1996, there were no longer any car ferries operating from Southampton with the exception of services to the Isle of Wight. The land used for Southampton Ferry Port was sold off and a retail and housing development was built on the site. The Princess Alexandra Dock was converted into a marina. Reception areas for new cars now fill the Eastern Docks where passengers, dry docks and trains used to be. Buses now provide the majority of local public transport. The main bus operators are First Southampton, Bluestar, Xelabus and Wheelers. The other large service provider is the Unilink bus service (running from early in the morning to midnight), which was commissioned by the University of Southampton to provide transport from the university to the town. Previously run by Enterprise, it is now run by Bluestar. Free buses were provided by City-link', but the subsidy provided by Southampton City Council was pulled in 2014 and the service now charges passengers £1 flat-rate single fare, with Red Funnel ticket holders continuing to travel free. The service was rebranded as QuayConnect in May 2016, with a red and white livery on the bus instead of blue. It runs from the Red Funnel ferry terminals at Town Quay to Central station via Westquay and is operated by Bluestar. There is also a door-to-door minibus service called Southampton Dial a Ride, for residents who cannot access public transport. This is funded by the council and operated by SCA Support Services. There are two main termini for bus services. First uses stops around Pound Tree Road and Vincent's Walk, except the X4 to Portsmouth and X5 to Gosport, which start and end their journeys from Westquay. This leaves the other terminal of West Quay available for other operators. Unilink passes West Quay in both directions, and the Salisbury Reds X7 service to Salisbury drops passengers off and pick them up there, terminating at a series of bus stands along the road. Certain Bluestar services also do this, while others stop at Bargate and some loop round West Quay, stopping at Hanover Buildings. There was a tram system from 1879 to 1949. People hailing from Southampton are called Sotonians. The city has produced a large number of musicians throughout its history, ranging from hymn writer Isaac Watts, who was born in Southampton in 1674 and whose composition O God, Our Help in Ages Past is played by the bells of Southampton Civic Centre, to more recent musical acts such as singer Craig David, who grew up on the Holyrood estate, Coldplay drummer Will Champion and solo popstar Foxes. Television personalities from Southampton include comedian Benny Hill and naturalist Chris Packham, and in recent years the city has also produced a number of competitive reality television winners such as Matt Cardle (The X Factor, 2010) and Shelina Permalloo (MasterChef, 2012), who operates a Mauritian restaurant named Lakaz Maman in Bedford Place. Radio personality Scott Mills was also born in Southampton. Novelist Jane Austen lived in Southampton for a number of years and the city has also been home to a number of artists, including Edward John Gregory, Hubert von Herkomer and John Everett Millais. Sports people born in Southampton include rugby union player Mike Brown and Australian tennis player Wally Masur. Being a port city, Southampton has been home to a number of seafarers including Charles Fryatt, who rammed a German U-boat with his civilian ship during World War I; John Jellicoe, who served as Admiral of the Fleet during the same war and later became Governor-General of New Zealand; and the last survivor of the RMS Titanic, Millvina Dean. Richard Aslatt Pearce, the first deaf-mute Anglican clergyman, was born in Portswood, Southampton. Ally Law, parkour, Youtube Blogger. ^ a b "2011 Census – Built-up areas". ONS. Retrieved 20 July 2013. ^ a b "British urban pattern: population data" (PDF). ESPON project 1.4.3 Study on Urban Functions. European Union – European Spatial Planning Observation Network. March 2007. pp. 120–121. Archived from the original (PDF) on 24 September 2015. Retrieved 14 May 2011. ^ a b c "Population". Office for National Statistics. Nomis web. 3 September 2013. Retrieved 26 September 2013. ^ a b "Mid year population estimate 2016". Office for National Statistics. Southampton City Council. Retrieved 18 July 2018. ^ Neighbourhood Statistics. "Lead View Table". Neighbourhood.statistics.gov.uk. Archived from the original on 12 January 2009. Retrieved 6 May 2009. ^ "Distance between London, UK and Southampton, UK (UK)". distancecalculator.globefeed.com. ^ "Distance between Southampton, UK and Portsmouth, UK (UK)". distancecalculator.globefeed.com. ^ a b Visit Southampton. "Famous Sotonians". Archived from the original on 2 April 2008. Retrieved 9 October 2008. ^ Lewis, Gareth (18 December 2008). "Carnival UK HQ completed ahead of schedule". Daily Echo. ^ Southampton City Council. "Southampton's Titanic Story". Retrieved 27 September 2017. ^ Solent Sky Museum. "Solent Sky | Southampton | Spitfire Legend". Retrieved 27 September 2017. ^ BBC Online (8 June 2007). "Solent Ship Spotting". Retrieved 19 October 2009. ^ British Archaeology Magazine (August 2002). "Great Sites: Hamwic". Archived from the original on 22 July 2009. Retrieved 19 October 2009. Hamwic, which is described as a commercial port (mercimonium). Hamwic (also known as Hamtun) must have possessed considerable administrative importance as by the middle of the 8th century it had given its name to the shire – Hamtunscire. ^ Southampton City Council. "Saxon Southampton". Archived from the original on 2 January 2011. Retrieved 19 October 2009. ^ a b c Southampton City Council. "Medieval Southampton". Archived from the original on 2 January 2011. Retrieved 19 October 2009. ^ British Archaeology Magazine (August 2002). "Great Sites: Hamwic". Archived from the original on 22 July 2009. Retrieved 19 October 2009. The economic motor driving trade [was] larger-scale trade in relatively low value commodities such as wool, timber and quernstones. ^ Internet Archive. "Monaco and Monte Carlo". Retrieved 19 October 2009. ^ a b c d BBC Online. "Southampton Town Walls and Castle". Retrieved 19 October 2009. ^ a b Southampton City Council. "God's House Tower: A History of the Museum". Archived from the original on 5 August 2012. Retrieved 19 October 2009. ^ Southern Daily Echo (2 April 2008). "Red Lion Plot". Archived from the original on 18 October 2012. Retrieved 19 October 2009. ^ Culture24. "God's House Tower Museum of Archaeology, Southampton". Retrieved 19 October 2009. ^ "Museum of archaeology (God's House Tower)". Southampton City Council. 27 September 2011. Archived from the original on 12 July 2012. Retrieved 6 May 2012. ^ Southampton City Council. "Post-Medieval Southampton". Archived from the original on 2 January 2011. Retrieved 19 October 2009. ^ "24 to be filmed in Southampton". ^ "The War over Southampton – PortCities Southampton". Plimsoll.org. 6 November 1940. Retrieved 3 June 2011. ^ Kieran Hyland (17 November 2016). "Your Guide to Southampton City Council". Wessex Scene. Retrieved 11 September 2018. ^ Emily Liddle. "SKATE Southampton set-up ahead of return of Westquay Ice Rink". Southern Daily Echo. Newsquest. Retrieved 5 November 2018. ^ "Wimbledon comes to Southampton as Westquay opens its own 'Murray Mound'". Southern Daily Echo. Newsquest. Retrieved 5 November 2018. ^ Oliver Wainwright (22 February 2018). "Studio 144: why has Southampton hidden its £30m culture palace behind a Nando's?". The Guardian. Retrieved 5 November 2018. ^ "Southampton medieval walls scheme work under way". BBC News. 24 November 2017. Retrieved 5 November 2018. ^ Greenwood & Co (1826). "Map of the County of Southampton". Retrieved 21 September 2007. ^ John Marius Wilson (1870). "Southamptonshire". Imperial Gazetteer of England and Wales. Retrieved 21 September 2007. ^ William Page, ed. (1908). "The borough of Southampton: General historical account". British History Online. Retrieved 17 March 2013. ^ "No. 43258". The London Gazette. 28 February 1964. p. 1856. ^ Name of file (2018). "Councillors – Southampton City Council". Southampton.gov.uk. Retrieved 13 August 2018. ^ a b "The Mayor and Sheriff". Southampton City Council. Retrieved 30 May 2018. ^ "The Town Crier". Southampton City Council. Archived from the original on 22 February 2015. Retrieved 22 February 2015. ^ Florence, Jeanne. "Le Havre – Les villes jumelées" [Le Havre – Twin towns] (in French). Retrieved 7 August 2013. ^ "Twin Towns in Hampshire". www3.hants.gov.uk. Archived from the original on 30 November 2009. Retrieved 6 November 2009. ^ "Sister Cities International". Archived from the original on 14 April 2012. Retrieved 4 November 2011. ^ "Sister Cities of Hampton, Virginia". Retrieved 4 November 2011. ^ "Interactive City Directory". Sister Cities International. Archived from the original on 30 March 2017. Retrieved 30 March 2017. ^ Environment Agency. "The River Test". Archived from the original on 11 March 2007. Retrieved 28 July 2007. ^ The Solent Forum. "Western Solent and Southampton Water Shoreline Management Plan". Archived from the original on 22 September 2007. Retrieved 28 July 2007. ^ eGovernment Monitor (8 July 2005). "Web Maps Out The Past". Archived from the original on 7 June 2007. Retrieved 28 July 2007. ^ Proudman Oceanographic Laboratory. "Tides". Archived from the original on 10 August 2007. Retrieved 28 July 2007. ^ Associated British Ports. "Southampton VTS – ABP Southampton". Retrieved 28 July 2007. ^ Captain M J Ridge, FRICS MCIT. "English Channel double tides". Retrieved 13 July 2009. ^ "History of Concrete Bridges". www.cbdg.org.uk. Retrieved 11 March 2008. ^ Southampton City Council. "Southampton Common Green Flag Management Plan" (PDF). Archived from the original (PDF) on 25 September 2007. Retrieved 26 August 2007. ^ Southampton City Council. "The Hawthorns Urban Wildlife Centre". Archived from the original on 2 December 2008. Retrieved 9 October 2008. ^ Southampton City Council. "Research, Information and Statistics". Archived from the original on 20 August 2007. Retrieved 24 July 2007. ^ Southampton City Council. "Southampton Statistics, July 2007" (PDF). Archived from the original (PDF) on 9 August 2007. Retrieved 24 July 2007. ^ "June 1976 maximum". Retrieved 21 March 2011. ^ "Extremes" (PDF). Fact Sheets. Met Office. Archived from the original (PDF) on 28 October 2012. Retrieved 11 March 2012. ^ "Southampton W.C Climate Period: 1981–2010". Met Office. Retrieved 5 February 2013. ^ "Long Term weather data". Met Office. May 2011. Archived from the original on 20 August 2011. Retrieved 20 March 2011. ^ British Gas News (22 May 2006). "Reading named as the UK's highest CO2 hot spot". Archived from the original on 13 July 2007. Retrieved 8 April 2007. ^ Andrew Nash (24 May 2018). "Population projections for local authorities: Table 2". Office Of National Statistics. Retrieved 18 July 2018. ^ a b c "Population". City statistics and research. Southampton SO14 7LY, United Kingdom: Southampton City Council. 3 September 2013. Archived from the original on 31 December 2010. Retrieved 26 September 2013. Population of Southampton Mid Year Estimate 2009, Total: 236,700 ... Source: Office for National Statistics Released 24th June 2010. ^ Office for National Statistics, Neighbourhood statistics: Ethnic group – percentages. Retrieved 8 April 2007. ^ "South: Polish immigration". BBC News. 16 June 2006. Retrieved 8 April 2007. ^ a b Institute for Public Policy Research. "Two Track Cities" (PDF). Archived from the original (PDF) on 9 July 2007. Retrieved 22 July 2007. ^ National Statistics Online. "South East Profile". Retrieved 11 September 2007. ^ Centre for Cities. "BBC News report". Retrieved 17 March 2019. ^ a b c Southampton City Council. "Southampton Statistics" (PDF). Archived from the original (PDF) on 9 July 2007. Retrieved 22 July 2007. ^ Southampton City Council. "Southampton Statistics and Research, January 2007" (PDF). Archived from the original (PDF) on 9 August 2007. Retrieved 24 July 2007. ^ "(DfT) Provisional Port Statistics 2007". Archived from the original on 22 November 2008. ^ "Carnival UK signs for new Southampton cruise terminal". TravelWeekly. 12 December 2007. Retrieved 5 January 2010. ^ "Carnival UK". businesssouthampton.com. Retrieved 5 January 2009. ^ "Duke of Edinburgh to officially open new Ordnance Survey head office". Ordnance Survey. Archived from the original on 20 January 2012. Retrieved 11 March 2012. ^ Lloyd's Register (21 April 2006). "Lloyd's Register announces plans to move Marine operations to Southampton". Archived from the original on 1 August 2008. Retrieved 19 October 2009. ^ "A new vision for Southampton (From Daily Echo)". Dailyecho.co.uk. 31 July 2008. Retrieved 6 May 2009. ^ Southampton City Council (March 2007). "City Awarded large Casino Licence". Archived from the original on 27 September 2007. Retrieved 11 July 2007. ^ IKEA. "IKEA Southampton". Retrieved 19 October 2009. ^ "McAlpine wins £70m WestQuay Watermark centre in Southampton". Construction News. Retrieved 5 February 2015. ^ "Southampton's historic centre set for revival as multi-million pound redevelopment approved". Southern Evening Echo. Retrieved 31 January 2017. ^ Southampton City Council. "4. An International City of Culture" (PDF). Archived from the original (PDF) on 22 March 2012. Retrieved 19 October 2009. ^ Southern Daily Echo (25 May 2006). "Grand Designs for New Hotel". Archived from the original on 26 June 2008. Retrieved 19 October 2009. ^ Southern Daily Echo (22 May 2007). "Four Star Hotel for City Centre?". Retrieved 19 October 2009. ^ Office for National Statistics. "Regional Gross Value Added Report" (PDF). Retrieved 22 July 2007. ^ Southampton County Council. "Old Town Development Strategy—Final Report" (PDF). Archived from the original (PDF) on 11 December 2014. Retrieved 3 December 2014. ^ Southampton County Council. "The Maritime Museum". Archived from the original on 25 April 2010. Retrieved 19 October 2009. ^ Southampton City Council (16 May 2007). "Southampton Boat Show". Archived from the original on 13 September 2008. Retrieved 28 July 2007. ^ Southampton Boat Show official website. "Southampton Boat Show". Retrieved 28 July 2007. ^ Celebrating Southampton's Connection With The Sea. "Sea City 2007". Archived from the original on 9 August 2007. Retrieved 28 July 2007. ^ The Nuffield Theatre. "The Nuffield Southampton". Retrieved 19 October 2009. ^ BBC Online. "Stage Awards Honour Theatre Industry". Retrieved 22 November 2015. ^ The Art House Gallery Cafe. "The Art House Southampton CIC". Retrieved 19 October 2009. ^ Bedford Place. "Welcome to Bedford Place". Retrieved 19 October 2009. ^ Invest in Southampton (27 November 2007). "Plans for the redevelopment of Guildhall Square to be unveiled". Retrieved 18 June 2009. ^ a b c d e f "Southampton Guildhall Tickets". Live Nation Worldwide, Inc. Retrieved 9 February 2010. ^ "d:Tour 1997 Live @ Southampton". Retrieved 9 February 2010. ^ "Bournemouth Symphony Orchestra". Archived from the original on 30 October 2009. Retrieved 29 March 2010. ^ "City of Southampton Orchestra". Retrieved 29 March 2010. ^ "Southampton Concert Orchestra". Retrieved 29 March 2010. ^ "Southampton Philharmonic Choir". Retrieved 29 March 2010. ^ "Southampton Choral Society". Retrieved 29 March 2010. ^ "Engine Rooms". The MRJ group. Retrieved 18 July 2018. ^ "The Talking Heads". Music Venue. Retrieved 18 July 2018. ^ "The 1865: Southampton's newest live venue". Music Venue. Retrieved 18 July 2018. ^ "The Joiners". Music Venue. Retrieved 18 July 2018. ^ "Turner Sims". Concert Hall. Retrieved 18 July 2018. ^ "Quarterly Listening". RAJAR. Retrieved 28 November 2017. ^ Southampton City Council. "Outdoor Sports Centre" (PDF). Archived from the original (PDF) on 25 September 2007. Retrieved 26 August 2007. ^ "Bradford named UK's fattest city". The Guardian. UK. 1 February 2006. Retrieved 26 July 2007. ^ "Southampton Still Amongst The Fittest". JCI Southampton. 24 March 2007. Archived from the original on 5 July 2007. Retrieved 26 July 2007. ^ BBC Online. "Southampton Old Bowling Green, Southampton, England". Retrieved 6 January 2009. ^ "Southampton's £30m police HQ opens". BBC News. 7 March 2011. Retrieved 11 March 2012. ^ Name of file (15 October 2012). "Safer Southampton – Southampton City Council". Southampton.gov.uk. Archived from the original on 9 March 2013. Retrieved 12 March 2013. ^ a b Home Office. "Local Authority Crime Statistics". Archived from the original on 7 December 2009. Retrieved 10 September 2007. ^ "Home Office Research Study 204 Review of police forces' crime recording practices" (PDF). Archived from the original (PDF) on 8 December 2013. Retrieved 12 March 2013. ^ Hampshire Constabulary. "Southampton OCU Performance Information". Archived from the original on 17 June 2010. Retrieved 19 April 2010. ^ "Will brexit damage UK universities?". The Guardian. 20 September 2018. Retrieved 9 November 2018. ^ Brexit and student housing (PDF) (1 ed.). London: KPMG. 1 May 2017. Retrieved 9 November 2018. ^ "Higher education students - where do they come from. A live report". www.hesa.ac.uk. HESA. Retrieved 9 November 2018. ^ a b University of Southampton. "About Us". Retrieved 28 July 2007. ^ HERO. "University of Southampton". Retrieved 28 July 2007. ^ Guardian Unlimited (1 May 2007). "University of Southampton". The Guardian. London. Retrieved 28 July 2007. ^ University of Southampton. "School of Engineering Sciences". Retrieved 19 October 2007. ^ "University of Southampton, Institute of Sound and Vibration Research". 9 October 2008. Retrieved 9 October 2008. ^ Guardian Unlimited (1 May 2007). "Southampton Solent University". The Guardian. London. Retrieved 28 July 2007. ^ Southampton City Council. "Southampton Solent University". Archived from the original on 27 September 2007. Retrieved 28 July 2007. ^ "School websites and contact details". Southampton City Council. Archived from the original on 1 January 2009. Retrieved 11 November 2008. ^ "Plans for tram-trains through Southampton (From Daily Echo)". Dailyecho.co.uk. 1 July 2009. Retrieved 8 July 2009. ^ "Travel by train to Southampton Airport". www.southamptonairport.com. ^ "Travel by bus to Southampton Airport". www.southamptonairport.com. ^ "QE2 Retirement – Southampton Video Included". Chris' Cunard Page. Archived from the original on 7 January 2009. ^ "Bluestar - Shining across your city". www.bluestarbus.co.uk. ^ Bluestar – Route list Archived 28 August 2008 at the Wayback Machine. Retrieved 4 October 2008. ^ Gibbons, Thomas (1780-01-01). Memoirs of the Rev. Isaac Watts. Buckland. ^ Kries, Susanne; Gardner, Nicky; Locke, Tim (5 May 2016). Bus-Pass Britain: 50 of the nation's favourite bus journeys. Bradt Travel Guides. p. 44. ISBN 9781784770198. ^ "Craig David to headline Common People 2016 in Southampton". Daily Echo. Retrieved 3 October 2016. ^ "Coldplay drummer's journey from Hampshire primary school to the Superbowl". Daily Echo. Retrieved 3 October 2016. ^ Wolff, Craig (21 April 1992). "Benny Hill, 67, English Comedian And Creator of TV Show, Is Dead". The New York Times. ISSN 0362-4331. Retrieved 3 October 2016. ^ "Chris Packham: As soon as I could crawl I was looking for creatures to capture and own". Retrieved 3 October 2016. ^ "REVEALED: What's happened to Southampton's X Factor hopefuls?". Daily Echo. Retrieved 3 October 2016. ^ "There's a new Masterchef in town, Nigella! Shelina crowned first female champion in seven years". Retrieved 3 October 2016. ^ "BBC - Press Office - Scott Mills". 15 September 2007. Archived from the original on 15 September 2007. Retrieved 14 December 2016. ^ Poplawski, Paul (1 January 1998). A Jane Austen Encyclopedia. Greenwood Publishing Group. p. 15. ISBN 9780313300172. ^ "Art by Southampton's famous artist Edward John Gregory could sell for £10k". Daily Echo. Retrieved 3 October 2016. ^ Press, Oxford University (21 June 2012). Benezit Dictionary of British Graphic Artists and Illustrators. OUP USA. p. 542. ISBN 9780199923052. ^ Lombardi, Laura (1 January 2009). From Realism to Art Nouveau. Sterling Publishing Company, Inc. p. 56. ISBN 9781402759260. ^ "Hampshire rugby star Mike Brown helps England rewrite history books against Australia". Daily Echo. Retrieved 3 October 2016. ^ Arena, Kevin Mitchell at the Emirates (20 September 2015). "Andy Murray beats body and Bernard Tomic to put GB in Davis Cup final". The Guardian. ISSN 0261-3077. Retrieved 3 October 2016. ^ "BBC - Southampton's Capt Charles Fryatt remembered at IWM". news.bbc.co.uk. Retrieved 3 October 2016. ^ "BBC - History - Historic Figures: Admiral John Jellicoe (1859 - 1935)". Retrieved 3 October 2016. ^ "Millvina Dean". Retrieved 3 October 2016. ^ "Full text of "Anecdotes & Incidents of the Deaf and Dumb"". ^ "Southampton YouTuber Ally Law given ban after Big Brother stunt". The Daily Echo. 15 December 2018. Retrieved 1 April 2019.